Danforth has the resources to respond quickly and professionally to emergency maintenance at your facility. We understand that an HVAC or Plumbing emergency can negatively impact a business far beyond the cost of the repairs. These emergencies can lead to further damage and lost time. 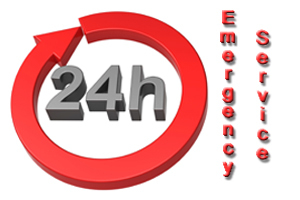 Danforth has 24/7 emergency service techs available respond to any and all HVAC and Plumbing situations. With over 30 experienced local professionals available, Danforth can get your building back up and running quickly. Our experts are committed to diagnosing and repairing the emergency with a sustainable solution. We will ensure that your HVAC and Plumbing systems are performing as designed before we turn them back over to you. Additionally, Danforth has Pipe and Sheet Metal fabrication facilities that can quickly and cost-effectively make needed repairs without waiting for an outside firm to provide custom products. This allows us to get your facility up and running faster which allows you to get back to business. Get Your Facility Back Up and Running with Danforth. Meet with one of our Emergency Service consultants. We’ll get a technician out to your facility and outline our costs. Fill out an Online Estimate and we’ll reach out to you with a Emergency Service proposal to quickly address your equipment issues. Get answers about our Emergency Service services and speak with a knowledgeable Emergency Service Expert.